For those of you who’ve already read my brothers post, history’s going to somewhat repeat itself, sorry! I had a hard time coming up with something to do this assignment on, and am a bit disappointed that I wasn’t able to find something better. Water under the bridge I guess. Friday, February 27th, was the last Friday artwalk in Eugene. As some of you probably already know, this event takes place the last Friday of every month. This month, most of it took place in the Whiteaker area in west Eugene. The event was scheduled to run from 6:00 pm until 9:00 pm. My brother, and some of my other family, left right around 5:30 to head over and see what we could see. It was the first time I’ve ever been through there, that I can remember. It takes up most of the residential area over around Blair Boulevard. It was pretty dark by the time we got over there and found a place to park on the corner of 4th and Blair. Since it was the very first time any of us had ever attended a last Friday art walk and didn’t quite know what to expect, we decided to walk some of the streets in the area and observe some of the neighborhoods interesting features. I thought to myself as we were walking along, for it being an “art walk”, I’m sure not seeing a lot of art, as far as paintings/drawings. There was a really interesting mosaic sculpture made up of colorful shards of glass right on the corner of Van Buren and Blair that we stopped to take a look. It was four figures all standing back to back of each other. I snapped a picture of my brother giving one of them a high 5, and then we moved on! Further up Blair Blvd. was a Serbian Orthodox church that I thought had unique architecture with its onion domed roofs and arched windows and entry ways. We also walked past the Ninkasi Brewing Company building which also had an interesting design, especially the big gates which had the logo branded into the steel. Must have just been built within the last couple years, because I went on Google Earth to find out where it was located and as of September 2011, the only building that was there was a garage. We then retraced our steps and cut across W 3rd Ave. to Van Buren St. At a tattoo shop across the street, there was a guy twirling a flaming baton, which was kinda cool to watch. Before heading back to where we parked, we wandered up Blair in the opposite direction of where we had parked. I finally spotted the first painting that I had seen on the trip, though it was difficult to make out all of the details, because by then it was completely dark. As best as I could tell, it looked like a landscape mural. That was pretty much the last place we looked at before heading back. We wanted to stop and get a bite to eat at the little Papa’s Soul Food place there on the corner of 4th and Blair, but we would’ve been hard pressed to even get in the front door! Not a bad trip, but never was quite sure where all the art was! 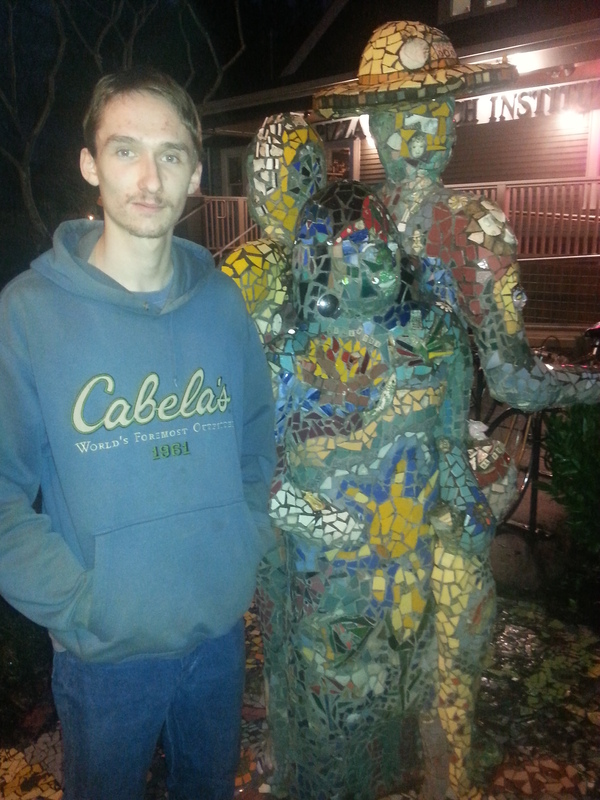 Standing next to the mosaic sculpture on the corner of Van Buren and Blair. This entry was posted in X4 on March 3, 2015 by macdonaldian93.